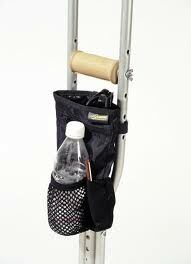 EZ-Access Universal Crutch Pouches are convenient and lightweight. These pouches easily attach to crutches and can store anything from keys, sunglass, cell phones, and even shampoo to the shower. Made of nylon and durable mesh. Black. Dimensions: 10" x 5 1/2" x 1 3/4". Dimensions: 10" x 5 1/2" x 1 3/4"